Unique and unexpected, a shiitake mushroom log kit from Lost Creek Mushroom Farm will set off the sparkle in a mushroom-loving mother’s eyes. All natural, easy to grow, and producing mushrooms every two months for 3 to 4 years, it’s a gift she’ll enjoy for a long time--it's guaranteed. 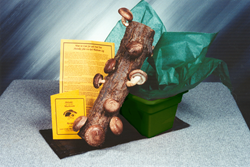 Great Mother's Day Surprise -- Shiitake Mushroom Log Kit with its own soaking tray, under $50. Other kits from $18. We grow our logs outside where they get rain and natural day-night cycles. They are very happy, healthy, productive logs. Shiitake mushrooms are the royalty of the gourmet mushroom world, according to Sandra Williams of Lost Creek Mushroom Farm. “They are most-consumed gourmet mushroom in the world,” she said, “and log-grown shiitakes are the queen, the premium quality among all shiitakes. Most people have never tasted shiitakes grown on all-natural logs. Lost Creek Mushroom Farm kits are available in a range of sizes and prices. The Original Tray Kit with a 14-inch log and its own tray for soaking, fruiting and storing the log, priced at $50. The Best Buy includes two tray kits for $90 shipped to the same address. The best-selling 10-inch Single Log Kit sells for $30; the Ma and Pa Log Kit with two 10-inch logs for harvesting shiitakes every month for $50, and a 6-inch ‘Shroomie at $18. Prices include shipping and handling. Logs are soaked in non-chlorinated ice water. In a few days little "pins" or buds appear. In 6-10 days the log has mushrooms. Crop size increases as the log matures. In the second and third year, the log can be covered with mushrooms, then growth tapers off. Logs require regular soaking every two weeks in non-chlorinated room temperature water. Every two months they can be "shocked" with ice water to grow more mushrooms. "Very easy," according to The Mushroom Lady. Janet Bratkovich’s Shiitake Sampler Cookbook with 51 kitchen-tested shiitake recipes is $9.95, but only $7.95 when shipped with the log kit, "A nice value added to the gift." In the life cycle of Lost Creek’s kits, the logs are cut in the winter, inoculated or “seeded” in the spring, and their first harvest comes in the fall. “The Mother’s Day logs are fully mature – proven, experienced logs. Now, in the spring, is the perfect time to start growing great shiitakes at home,” The Mushroom Lady said. 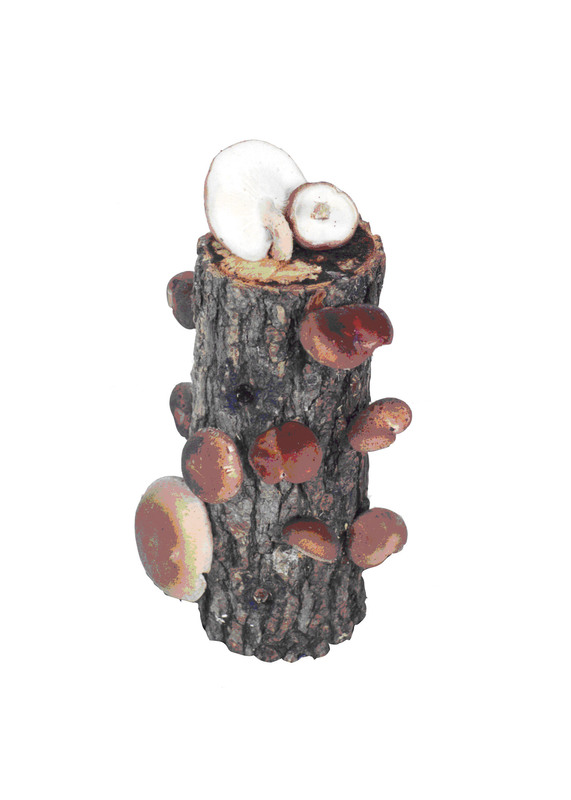 All logs over 9” are fully guaranteed to grow shiitakes. Sandra and her husband Doug donate a portion of Lost Creek's sales to Mushrooms in Ghana Project, working with small-scale mushroom farmers in West Africa, especially women, to increase production and sales. 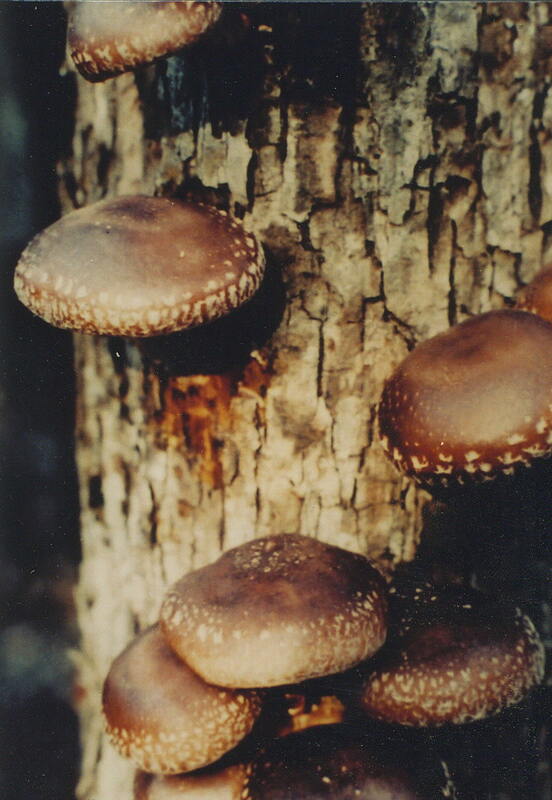 They also teach and promote shiitake mushroom farming on logs.